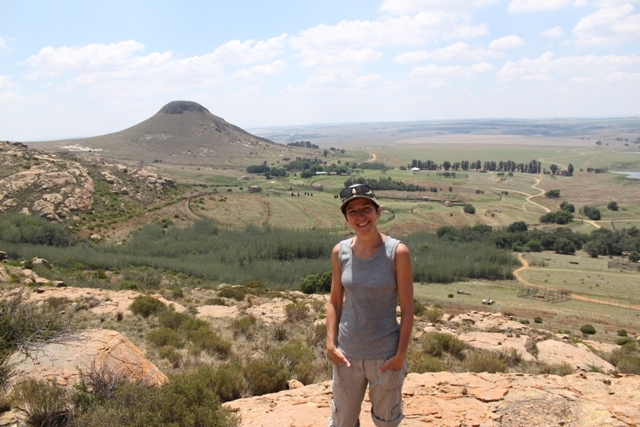 Jacky spent 4 weeks volunteering at Lionsrock and has written a fantastic blog post for us detailing what life was like for her in South Africa. More than five months have passed since I spent four weeks as a volunteer at Lionsrock, in South Africa. I am back home and back to my routine, but not a single day has passed without having thought about this fantastic place and the great experience I have had with these beautiful big cats. Lionsrock Big Cat Sanctuary, a project created by 4 paws is such an amazing place. The team is doing such a wonderful job. 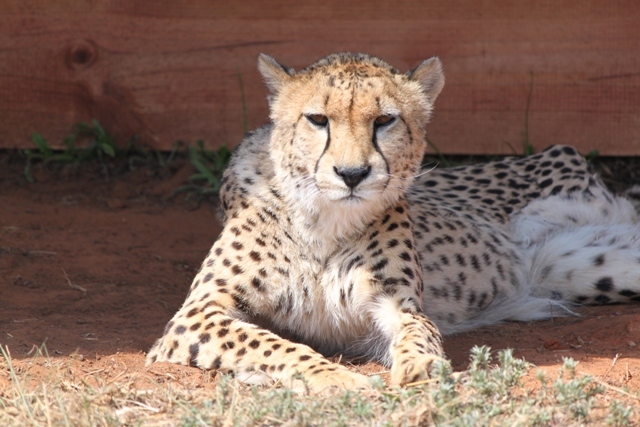 They take care of more than 100 big cats such as lions (mainly), tigers, leopards, cheetahs, caracals, servals and also wild dogs and hyenas. All of these animals bring their own life story, which in some cases are unbelievingly cruel and sad. 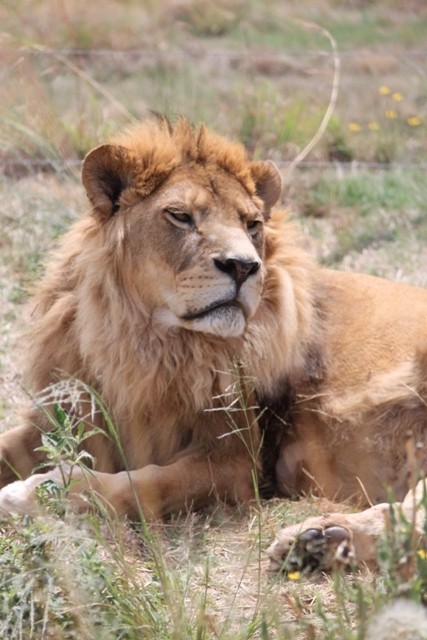 None of them will be able to go back to a normal life but at Lionsrock they get a chance to live in peace and dignity. There’s enough space to run around, play, feel grass under their paws, lay in the shade of a tree or bush and smell the fresh African air. I could hear the lions roar at dawn. A pride of 11 lions was in an enclosure just a few metres from my bedroom. I could see them even from my bed when I woke up in the morning….I loved that view and the sound of the roaring. My days as a volunteer were filled with many things but the major task was the monitoring. I liked those sessions the most, doing my daily tour to visit those animals that needed special attention. Let me give a few examples. There is Gipsy in the Special Care Unit. 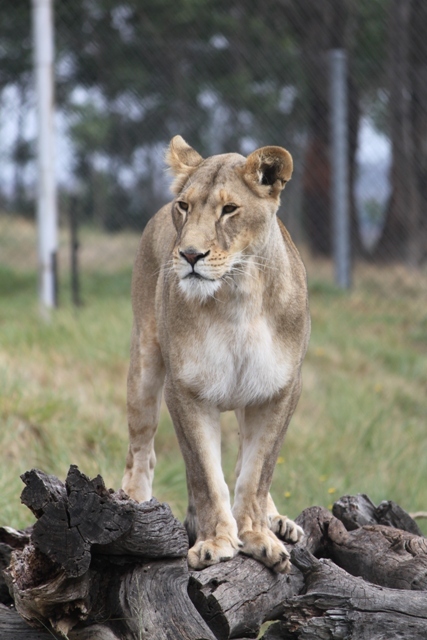 She’s an older lady that came to Lionsrock in July 2014. Her legs grew short due to malnutrition and living on a concreate floor for many years. Andy is currently in the Adaption Unit. 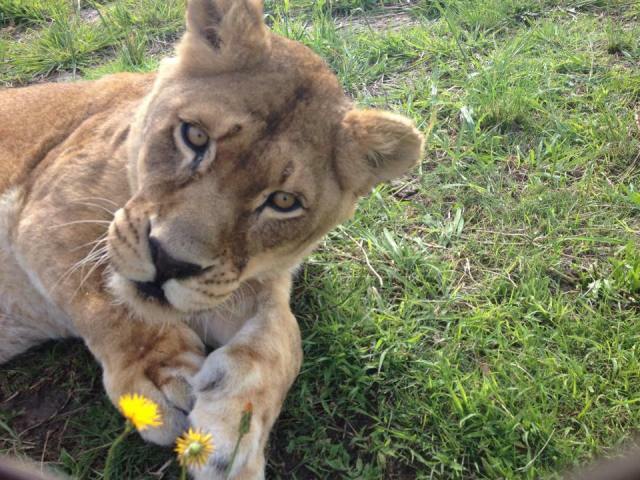 She is only 2 years old and came to Lionsrock as a cub. 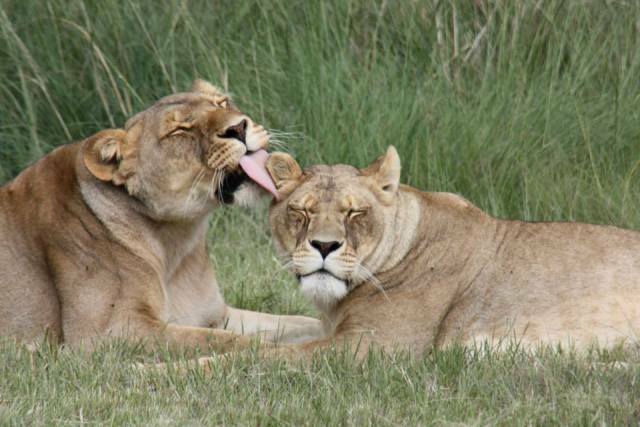 She is very friendly since she lived with a private owner; but lions are used to live in a pride and therefore, the team is now looking to find a male partner for her. Sasha was brought to Lionsrock only a week before I arrived there. He was found in the wild with a very badly injured leg, which unfortunately had to be amputated. I visited him every day to get him used to humans. He aclimatised very well to his new home and after only four weeks, we opened the lock from the feeding enclosure to his new big enclosure….this was a very exciting moment (not only for him)! came by for an examination. His pad recovered satisfactoraly and just recently the team moved him to a new enclosure. I am delighted to know that he is recovering well. During my stay, twice on Fridays we had school classes visiting. The classes were rather large with about 150 to 200 kids between the ages of six to twelve. I helped to keep the group together when we walked to the enclosures. The kids were all very interested and so excited about the big cats and to my astonishment, nearly none of them ever saw a lion in their life before. It’s great that they learn from an early age how important it is to respect the animals and protect them. At the end of the day I was quite exhausted but I had great fun and the kids always behaved very well. My volunteer colleagues were Christiana (Austria) and Tony (Scotland). We’ve spent a fantastic time together. I can call myself lucky that we all got along with each other. I enjoyed and appreciated this time so very much. I am confident, that even in this short time of 4 weeks I was able to make a difference and make these animals feel welcome and comfortable. I definitely will go back as soon as possible. Hildegard Pirker, Head of Animal Welfare Department at Lionsrock is a wonderful and passionate woman, giving a lot of love to these animals. I want to sincerely thank her and the team on site for welcoming me into their community and for giving me the opportunity for this unforgettable experience! I have learned so much! If you would like to see for yourself what Jacky is talking about then check out our lion conservation volunteering website or contact Anne on 01892 770 771. Next Post Why are coral reefs so important?